We have recently had some early summer scorchers, with very little rain, that has just decimated the garden – the heat and humidity have been intense, so this thought is not far from everyone’s mind. WHAT FOOD CROPS WILL SURVIVE THROUGH THE SUMMER? 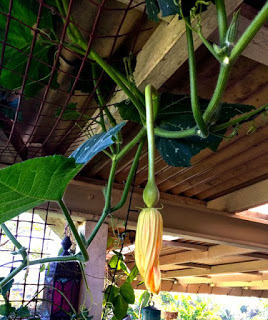 This was the question that my neighbour asked me the other day and my answer was almost spontaneous; okra, snake beans, amaranth bi-colour, eggplant and the trombone squash – all subtropical plants to survive our weather conditions. I leave the corn and sweet potato for those with more land than me. 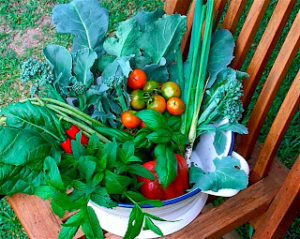 I still have some tomato, kale and cucumber plants struggling on from winter and spring but, in this heat, you can forget lettuce, Asian greens and other green beans. 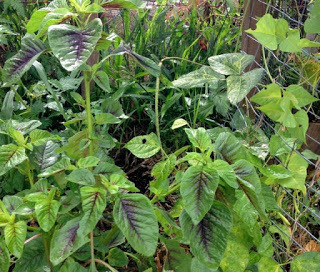 Amaranth bi-colour – the spinach alternative. 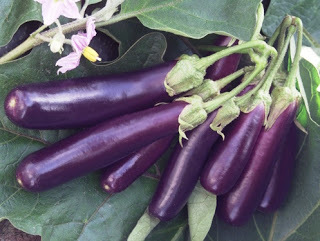 Very nutritious and easy to grow – you just have to get the right variety – this one! 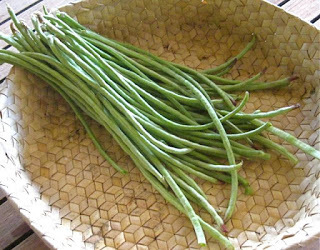 WHY is this one of the most rewarding summer vegetable crops? 1. 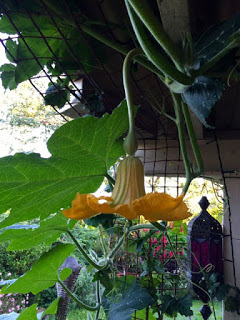 It is very easy to grow, surviving the summer heat and humidity – it just needs a frame to grow over – like a trellis or an arbour. Plant the seeds, that you have saved from the year before or bought from a reputable company like Diggers Seeds of Green Harvest (I got mine from my mate Dave) in the springtime. 2. This zucchini/courgette/squash is a fast mover – you can virtually watch it growing in front of your eyes. This one reached 52cm in one week – I just love it. There aren’t many plants that having me dashing out with the ruler, first thing in the morning, and gaping in awe at just how fantastic nature can be. 3. 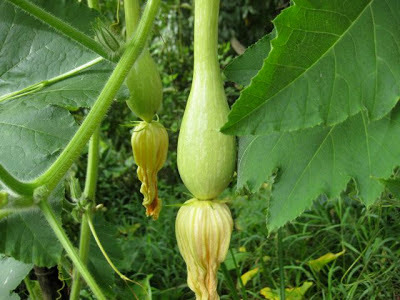 It is very prolific – one plant will give you heaps of fruit. You just may have to intervene and help it along by hand pollinate if it raining and there are no pollinators around. This is easy. The male and female flowers are borne on the same plant – the female giving you the fruit and male the pollen for fertilising – and their structure easily tell you which one is which. So you just pick the male flower with the pollen on his pokey-out-bit and stick it in the female – bingo – who said gardening was boring? 4. 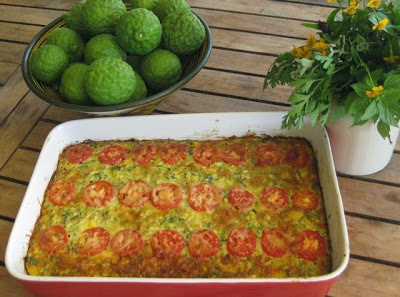 This is a nutritious and versatile food that I turn into lots of delicious dishes; corn and zucchini bake, bubble and squeak and the really yummy haloumi and zucchini fritters. I also like to serve it as a side vegetable – simply sliced and tossed in some hot olive oil with garlic and black pepper, then finished with a squeeze of lemon juice. You don’t have to peel it! 5. 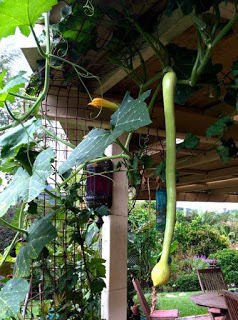 You only use the long stem part which is seedless, less watery than ordinary zucchini and has a firm nutty flavour. The round bit at the end contains the seeds – which you can discard. 6. 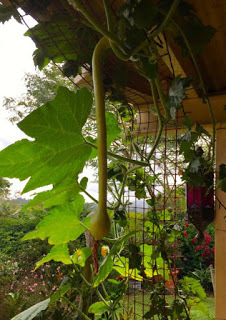 I always let one hang on the vine until it is dried and hard – the seeds will begin to shake around in the rounded base. Store these in a cool dry place for next year.